Valentine’s Day… but why though? So here it comes again, that dreaded (or highly anticipated) day of the year, Valentine’s Day. A lot of us as men feel pressured by Valentine’s Day. We don’t like being expected to do something romantic for the wife or girlfriend(s) on an arbitrary date on the calendar. Some of my male friends flinch when their mate drops hints in early February about what flowers or candy she prefers, and they cringe when she talks about how somebody else’s husband/man goes over the top for his Valentine’s sweetie. I criticise the commercialism of the day. It just presents another opportunity to draw the already dwindling funds out of the pockets of the public (this includes our children too). Valentine’s Day in our culture is for new couples who need to affirm their special relationship. I really don’t think secure couples need it. By now most of the women reading this have started to knit their eyebrows and make notes of disapproval. Please leave your thoughts at the end of the blog, lol. Most women, even if they intellectually agree with these arguments against Valentine’s Day, secretly wish their mate would do something special for them on February 14. Not wanting to be controlled by a schedule or by their partner’s expectations, many men, especially husbands, end up doing something do something token on Valentine’s Day (a last minute card or candy). Others strike up some “bone of contention” which leads to a quarrel in the days leading up to the 14th and affirm their objection to the whole thing. Admittedly, despite my own opposition to the Valentine’s Day matter I’ve been known to give in and get her something special. In recent times I’ve opted to invite her over for a candle-light dinner which I prepared from scratch. It saves money and she loves the ‘thoughtfulness’. It certainly beats taking her for a ‘fluorescent-lit” location like KFC just so I can save a few dollars. I particularly despise how the day shows up the single people. It’s almost as if you’re single on V-day you’re an outcast of sorts. Where’s the day to celebrate being “free, single and disengaged”? Valentine’s Day should have an alter-ego day also celebrated on Feb 14 – “Single Awareness Day”. I’m sure a survey will prove that adults not in a committed relationship are the most annoyed people on or around V-day. What about the ‘mateys’ and ‘joe grinds’ who can end up being neglected on that day? What about their feelings? Where’s their day? I now mark the date on my calendar and try to be extraordinarily thoughtful. My wife also has a low-key approach to the day which is perfect for us both. We spontaneously do ‘sweet’ little things for each other so even if all we do on Feb. 14th is wish each other a happy V-day then it’s not a problem. It won’t be used as ammunition in some future disagreement. In the larger picture, cultural fixtures like Valentine’s Day provide scheduled opportunities to do good things that we could do any day, but usually do not. You should honour your parents on a daily basis but Mothers’ Day and Fathers’ remind you to do something particularly nice for them as a reminder of your love. Maybe there’s nothing wrong with a little forced spontaneity to show a little romantic love once a year? Right? 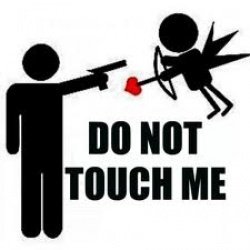 … I still say NO for V-day, lol. If you’re really into Valentine’s Day, and it is important ritual to you and your partner then just go hard, within reason of course. Make it a big special occasion. Save up and do something special if necessary, don’t let the superficial/commercial nature of the day get in your way. I know it just aint my cup of tea.